The Diamond Jubilee of Queen Elizabeth II -- a celebration of the 60th anniversary of the beginning of her reign -- has been taking place throughout 2012 on a number of fronts. a Diamond Jubilee Pageant, also known as "The World Comes to Windsor," which featured more than 500 horses, Cossacks from Russia, cowboys from Oklahoma, huasos from Chile and, yes, Susan Boyle. the honor of the Queen Elizabeth II Diamond Jubilee Medal being designed to commemorate the event. The medal is being awarded to about 450,000 members of the United Kingdom and 60,000 Canadians. and, of course, a Google Doodle featuring diamonds and corgis. The two O's in Google are diamonds, while the E is within the Queen's crown. 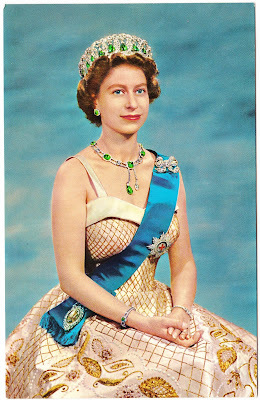 Here on Papergreat, I've already featured the Queen once. On her 85th birthday last year, I wrote about a 1957 magazine cover and an old postcard. Now, for the Diamond Jubilee, I have five more extremely cool vintage postcards featuring the Queen and her family. At the top of today's post is a "John Hinde Original" color postcard of the gorgeous-looking monarch (presumably from sometime in the 1950s). The unused postcard also has this text: "Colour Photograph by Baron Studios" and "Published by John Hinde Ltd., 6 Rupert St., London W.1. Tel. : GER 1734: Empire." 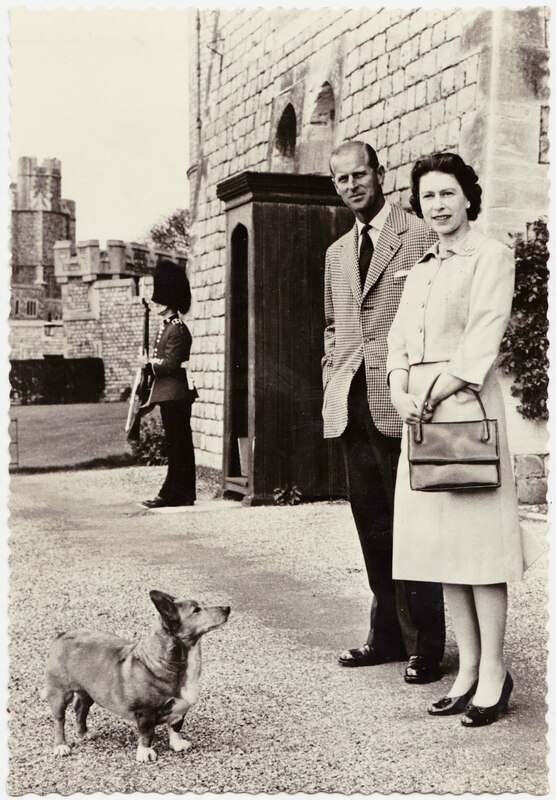 The royal dog is not identified. 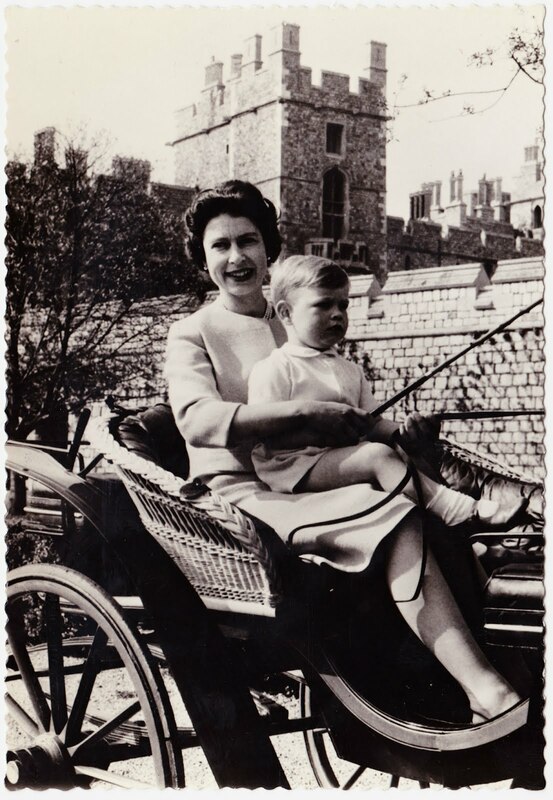 HER MAJESTY THE QUEEN WITH PRINCE ANDREW AT WINDSOR CASTLE. Above: No manufacturer is listed for this last postcard. 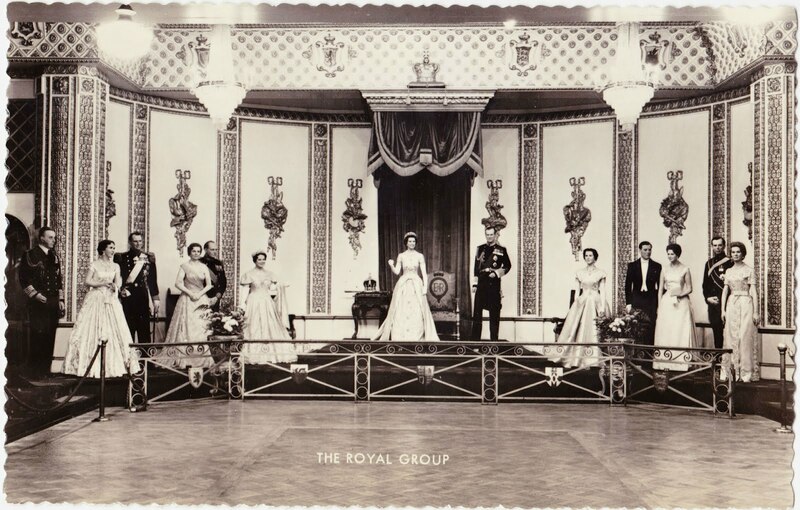 Printed on the front is "THE ROYAL GROUP." On the back is the statement "THIS IS A REAL PHOTOGRAPH." 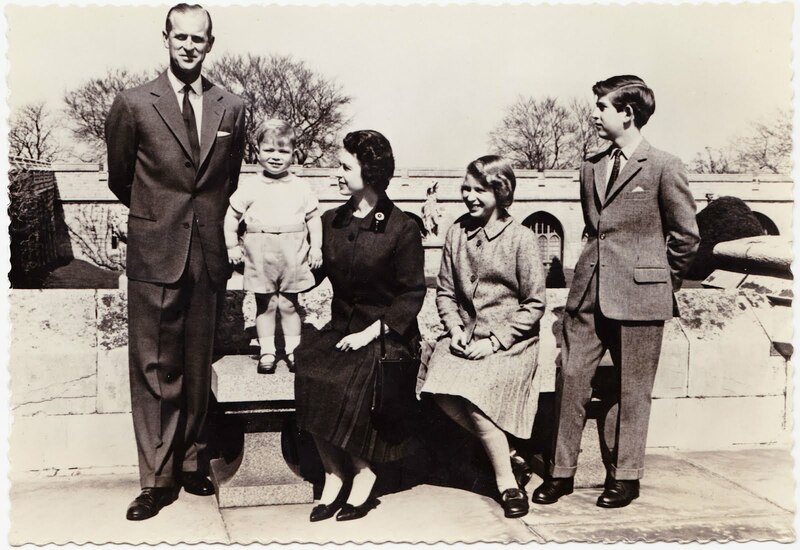 Elizabeth II and Prince Philip are clearly pictured in the center of this group of royals. But I have no idea who all those folks to the left and right of them are. Chime in if you recognize anyone! 1. Also, according to Wikipedia, Queen Elizabeth II wore "an ensemble designed by royal couturier Angela Kelly, comprising dress, coat, hat and shawl. The coat, which had a pleated frill at the front and neck, was of ivory boucle, decorated with gold, silver and ivory paillettes and Swarovski crystals. The matching hat had a small cockade of feathers in gold, silver and ivory, each trimmed with a crystal. Her jewels were the diamond starburst 'Jardine brooch', a three strand pearl necklace, and pearl earrings that had belonged to her Grandmother Queen Mary." 2. It kind of reminded me of this. 3. Sir Tom Jones sang Randy Newman's "Mama Told Me (Not to Come)". On the other hand, perhaps Elizabeth II was delighted with Jones' choice. Perhaps it reminded her of the great party scene from "Boogie Nights." 4. Not to be outdone by Sir Tom Jones, Sir Paul McCartney played "Live and Let Die" for the Queen. I wish Freddie Mercury was still alive, so that he could have performed "Fat Bottomed Girls" at this concert. 5. The always dependable Metropolitan Postcard Club of New York City website provides an in-depth history of Valentine’s here. The last photograph/postcard has to be a photo of the royals and entourage...in wax. Maybe from one of Madame T's (won't attempt to spell the name)museums. Anyone agree? I agree. The Imperial State Crown would be have had it's arches lower this time, and in the pic it look way too tall. And why would Prince Philip not have his own chair? Definitely looks very "wax like" in their positions in general, and their hand positions and facial expressions specifically. They also appear to be all "spread out" so as to give the viewer of the original tableau the opportunity to view each one all the way 'round. I have never been to Madame Tousseau's establishments, but this looks on par with that quality from the photographs I have seen of their displays. And, yes! Where IS Prince Philip's chair? Ahhhh - before anyone else can jump on it, I will do so myself! I botched the spelling of that iconic museum's name, and here is the correct spelling - Madame Tussaud's - I do believe!